I was held back by mere trifles, the most paltry inanities, all my old attachments. These laws are universal. Unaffected by time, place, birth, or circumstance, together they constitute the "Great Law of Life." Happy New Year and welcome to the first issue of Higher Vibrations for 2009! Can you believe it another year has passed. I hope you are as excited about 2009 as I am. When it came time to write this month’s article I really was not in the mood to write. I had decided to use last year’s article A New Year’s Resolution (Worth Keeping) and I wondered how many of you actually took my challenge last year. However, the Universe had other ideas and out came this month’s featured article A Path to Non-Attachment. It is a very personal story that happened to me last year. I hope you find the information useful in your own life. I send blessings to everyone as we move forward into the New Year. Things will be difficult for many people as the economy continues to change and we move through this transitional period. Remember what I said last month that sometimes we see only part of what is happening and at other times we may see all that is happening, but then not understand what it means. Continue to use this time to gain perspective and go inward to explore your true self. Then share your love and light with others. Be with people who lift you up and celebrate you, just the way you are. I believe that no matter what we think is going to happen that things will end up in an even better place than we could have imagined. Join me in setting this intention for 2009. We are all in this together and it is by being and coming together in our families, communities and the world at large that we will create something better. Please help me by forwarding this e-newsletter to the people you feel will benefit from this information. Our mission is to create a safe and healing environment for those who wish to connect with others while exploring their own path in life. We do not practice religion but draw from our own life experiences so we may come together as equals to foster the growth of who we are as human and spiritual beings. We seek to learn about ourselves for the betterment of our lives, relationships and for the healing of our planet. We do this with the understanding that changing the world first begins with changing ourselves. 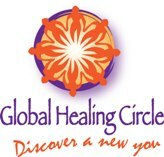 The Global Healing Circle was created with my friend Suzy Baldwin we will encourage you to participate more in the process of creating your life by releasing blocks, setting new goals and reaching for new heights. We believe that your potential as an individual, and our potential as a global community, is unlimited. Those who choose to join our circle will be part of a process that is ever-changing and ever-evolving to meet the needs of the group. Individually, we will explore, honor, and learn from our differences. United, we will connect, inspire, and reach for something greater than that which we currently know. Come try us out. Do as much or as little as you like. Share, only, if and when you’re ready. If it feels like home, stay awhile. If it does not, we thank you for your time and consideration, and send you blessings as you travel onward. Whoever, wherever you are, we honor you as part of the whole. The meetings are free and everyone is welcome. So if you are ready, we invite you to join us. Dates and time listed below. We are looking to expand these meetings across the globe so anyone interested in supporting this vision and would like to start a meeting in your area please contact us. You do not need any experience just a desire to help others. We meet the third or fourth Sunday of each month at 4:00PM. The following dates are subject to change so please verify before attending. Please help us by forwarding this announcement to your friends and family. EXIT onto Embarcadero Road. (West), toward Stanford. RIGHT at sixth signal onto Waverley Ave.
330 is the last building on the left. Go up the outside stairs to your left. EXIT onto Page Mill Road (East). RIGHT at signal onto Churchill Ave.
LEFT at stop sign for Waverley Ave.